Welcome to Allen’s Point R.V. Park! Commonly referred to as just “Allen’s Point” the park was constructed and opened for business by Nolan Allen in 1972. My name is Neil Dishman and I purchased the business in Aug 1994. We sold the business in Jan 2008 and have now assumed ownership once again as of 1 Jan 2010. I was born and raised five miles East of Allen’s Point and fished the Verdigris River with my brothers before it became Lake Oologah . My wife, Terry, is a native of Wisconsin, a 20 year retired Air Force Veteran and has been the backbone of the business. We have two sons, two daughters and two granddaughters. When looking at a map, you will find we are located on the only cross-over road half-way on Lake Oologah. The business park is nestled in a hollow just West of the Winganon Bridge. 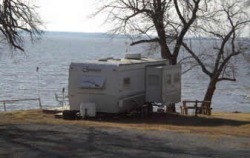 The quiet atmosphere, enhanced by the beautiful lake views are a vacationer’s paradise for both the casual camper and the avid fisherman. Lake Oologah offer’s 29,500 acres of water to fish, swim, boat, or just drift the hours away. Allen’s Point is the only privately owned business on the Corp of Engineer’s lake. This flood control lake was not constructed as a resort lake (that is to say that there are not a multitude of subdivisions or golf courses built along the shorelines), therefore; it offer’s some of the best fishing in Oklahoma. The angler can match his wits and skills against: Blue Cats, Channel Cats, Flathead, Spoonbill, White/Black Crappie, White “Sand” Bass, Hybrids, Large/Small Mouth Bass, and Walleye. The bow fisherman can delight in Gar, Buffalo, Carp, and Drum. You may check the fishing reports page to find out what is currently happening in the general vicinity. To find out lake levels, water release, weather reports, etc., please check out the links page to answer those questions which are most asked by phone. Allen’s Point R.V. Park (no mobiles) is open year round. Unlike the Corp of Engineer’s facilities, we do not restrict your stay to two weeks. We offer a variety of rates depending on your length of stay. 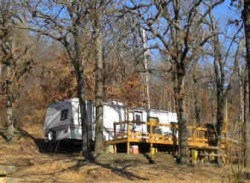 The park sits on 5 treed acres and has 30 sites; 19 Full Hook-ups and 11 Water/Electric Hook-ups. Park electrical is 30 Amps only. We now have Shower Facilities available and are restricted to tent and pop-up campers only. For those who wish to live here on a permanent basis; no room additions are allowed. Porches are available on some of the sites. If you wish to build porches it must be discussed with the Owners. When built they must be portable and if not, they remain with the site when you decide to move. The common areas will be maintain (mowed and trimmed) by the management but Tenants will be required to weed-eat the immediate areas around their RVs along with their personal gardens/flowerbeds/fire-pits. You will find that after the Catfish spawn, staying at this facility is like having your own personal lake since most recreational traffic is found on the south end of the lake.